The Bugis Pinisi is in part a copy of a western schooner of the mid-nineteenth century and the word pinisi is thought to have come from the english word pinnace. They are recognized by their tall ketch-rig of seven sails including two tops sails and three jibs, with a bipod or tripod mast and fixed gaffs. Most have a long raking bow and bowsprit. The other characteristic is the two lateral rudders which are supported on heavy beams which run right through the stern. I first saw the Ombak Putih when anchored off Sumbawa in another vessel. 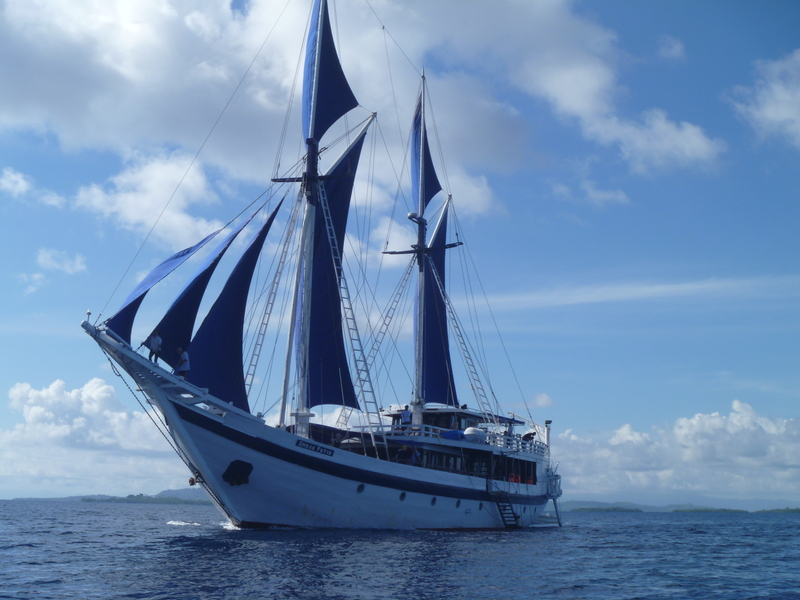 When the Ombak Putih with her sleek white hull and large blue sails came into view and anchored nearby -it was ‘love at first sight’. The Ombak Putih is a mix of traditional and modern ‘pinisi’ design. Her hull and rigging are traditional, while the deckhouse and interior are custom-designed to fulfil the need for a spacious, open and comfortable vessel. An important design principle was the need for a boat, which would provide ample room for both 24 guests plus crew, with each cabin air conditioned and with an ensuite bathroom. The design therefore incorporated a large deckhouse that was low enough to maintain the original sail plan, while also providing sufficient sleeping and living quarters for the crew and a spacious lounge and kitchen for the guests. Behind the bridge on top of the deckhouse, the design incorporated a large sundeck with a canopy to provide shade. The Ombak Putih was built alongside a muddy river in Batulicin, Kalimantan. On a deserted piece of land, the keel was laid on 11 May 1996. Finding suitable timber for the keel was not easy as ideally it should consist of only one piece. The Ombak Putih’s keel measures 23m by 40cm by 40cm. Construction then started with the adding of the bow and the stern pieces of the keel. The position and length of the keel, stern and stem will always determine the shape of the hull. The shipbuilders’ technique was to place the first skin planks from the keel upwards. No moulds were erected before the skin planking reached at least 1.5m above the keel.The Buginese boatbuilders are renowned for their skills but it’s still amazing that this huge structure (36m in length, with a beam of 10m and a draft of 4.5m) was made without any drawings, fully relying on the craftsmanship of its builders. A Dutch naval architect was hired to design the interior and the deckhouse and to recalculate all of the dimensions. On 27 May 1997, the Ombak Putih was launched. Buginese tradition demands that a goat is ritually sacrificed and its blood scattered over various important parts of the ship. In June, the owners received the official ownership documentation, and the crew then navigated the boat to Surabaya where suppliers were already waiting to install air-conditioners, electrical cables and bathroom fittings etc. In Tanjung Perak, the old canal-type harbour of Surabaya, the boat finally began to look like a real sailing vessel. The top masts were positioned with the help of a huge crane, and the hull was painted white, initially with just two coats of paint although it would take ten coats before the boat really looked white. 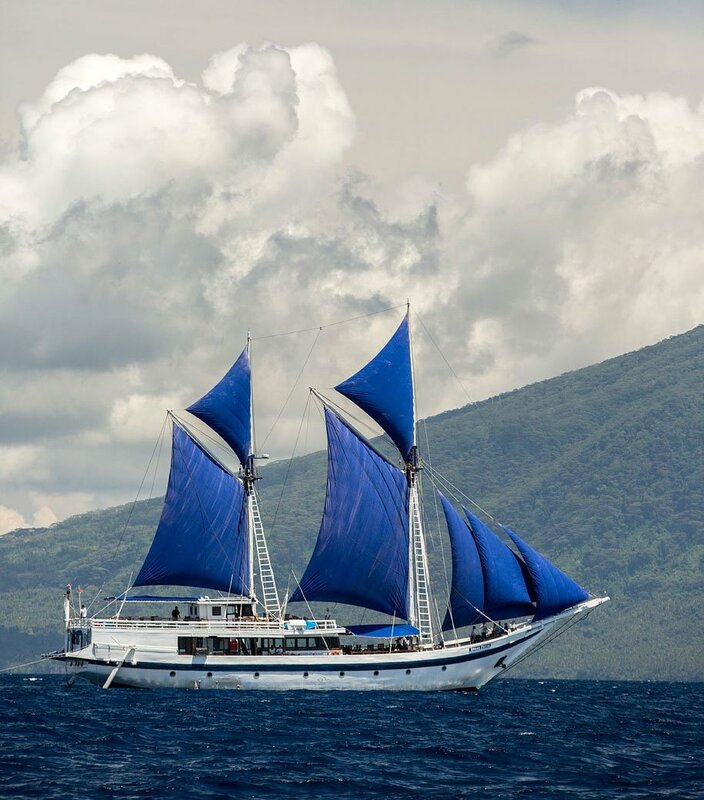 On 9 August 1997, the beautiful Ombak Putih triumphantly set off on her maiden voyage to Bali. This entry was posted in Uncategorized and tagged bugis pinisi, ian burnet, ombak putih, seatrek. Bookmark the permalink. Hi Ian, My daughter, Melissa and I were only discussing yesterday about enquiring whether you would be conducting a similar tour next year? We both have commitments at the time of your trip this year. Now, reading the information about the lovely Ombak Putih I am keener than ever. Will you be sailing in 2016?